On Oct. 22, 2014, "Recommended Principles and Guidelines for Human Rights at International Borders," was released at the UN in conjunction with a report from UN Secretary General Ban Ki Moon addressing migrant children as well as borders. 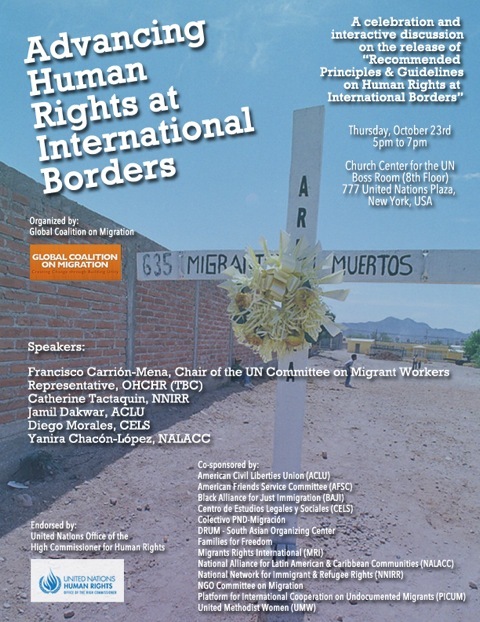 NNIRR Executive Director Catherine Tactaquin spoke about recent reports of migrnt deaths at the US-Mexico border and in the Mediterranean in remarks on March 23 2015 in Geneva, at a panel hosted by the Office of the High Commissioner for Human Rights and the Philippine government. "...we urge governments to fulfill their human rights obligations at borders, to provide for the safety and due process of all migrants--men, women and children--and to actively take responsibility to save migrants lives, as a primary and urgent matter." This new document will be the focus of a new international initiative to raise awareness and to actively pressure governments to reform their policies and practices at borders, with a particular emphasis on the rights of migrants without documents. The non-binding document draws upon existing norms and standards in several UN conventions and treaties and reaffirms the importance of human rights at borders, emphasizing that international borders cannot be considered "zones of exception" where human rights are not recognized. NNIRR and several other civil society organizations, including other members of the Global Coalition on Migration, participated in the drafting process headed by the UN Office of the High Commissioner for Human Rights (OHCHR). 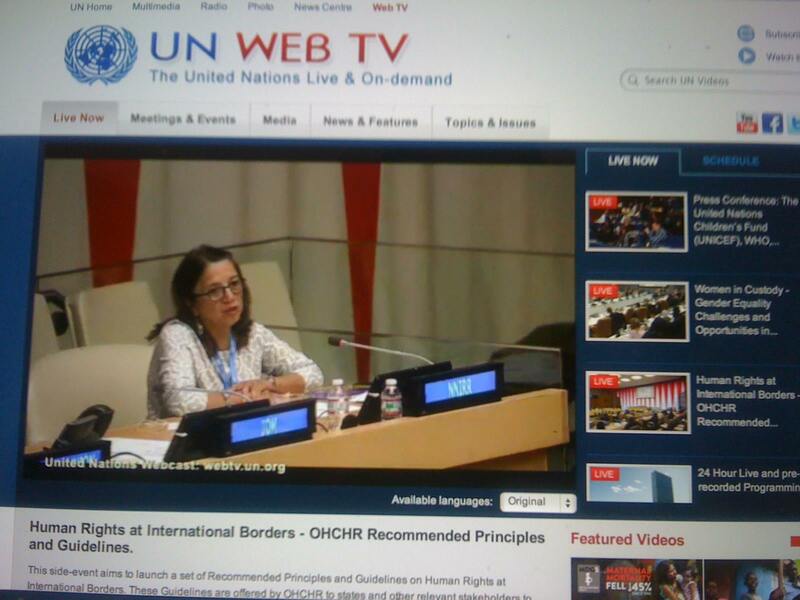 NNIRR Executive Director Catherine Tactaquin was invited to speak in the UN at a launch event hosted by OHCHR on Oct. 23, 2014 in New York. She cited comments from NNIRR frontline border rights defenders, Isabel Garcia, Eduardo Canales and Christian Ramirez, all members of NNIRR's Board of Directors. Her comments can be read here, and a webcast of the event can be accessed here. NNIRR also helped to organize a welcoming event that evening hosted by the Global Coalition on Migration, with participation from a broad range of civil society groups.